A brilliant novel, showing us the cogs in the marriage making machine that is the Bennet household. After all, who fetches all those endless trays of teas and delivers the interminable letters? This novel only really works, of course, if you didn’t realise that Pride & Prejudice was satire, and not meant to be taken seriously as the great romance it is today. You become quickly bound to these people who have hopes and dreams of their own, but are powerless to do anything about it while they remain in service. 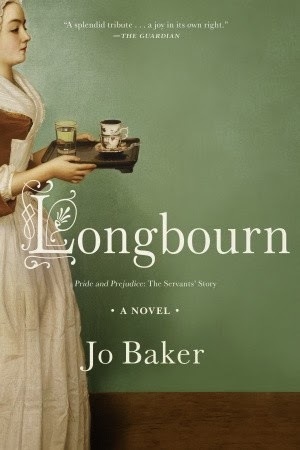 Jo Baker has crafted an excellent setting where the world seems constrained to the outer fence of Longbourn, despite the characters’ desire to travel beyond this boundary. It also manages to entertain while completely removing the shine from P&P. If you didn’t like Mrs Bennet before, you certainly won’t after reading this. She even managed to make me take a dislike to Lizzie and Jane. I didn’t enjoy the ending – I’m not sure why, but it just didn’t seem to click with me. Other than that, it is a perfectly practical, realistic counterbalance to the fantasy of P&P and most definitely worth the read. The author’s obsession with “that time of the month” did wear on me slightly, but I imagine it is something that would have been a concern of women at the time and that modern women would like to know more about.